You can show your skill and not fail to impress in an interview after you’ve impressed the hiring authority with your sample resume and cover letter. 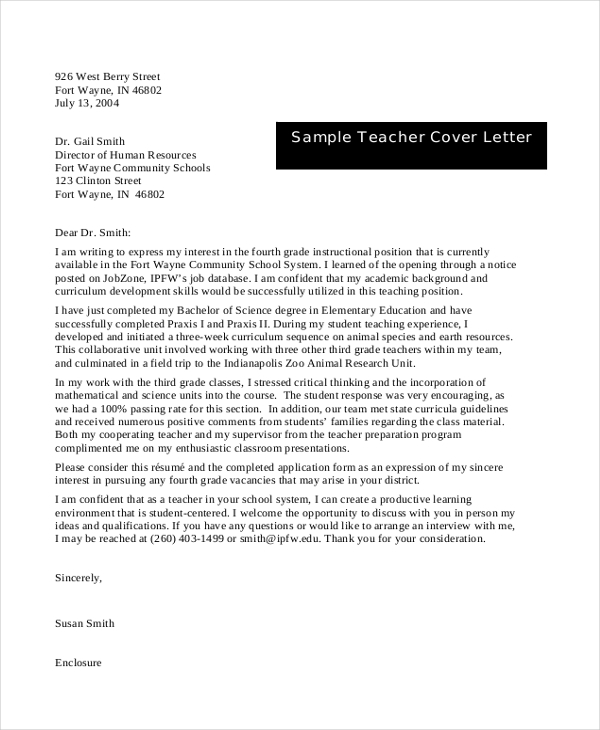 This assortment of teacher cover letter allows you to bring out your best and showcase it on your cover letter. Generally, the hiring authority from all type of institutions looks for something more than just qualifications, which is exactly what you can deliver with the help of these Sample Letters. This Cover Letter Example For Teacher is your ultimate guide to composing an outstanding cover letter. It briefly covers all the essential parts including skill, academic qualification and why you are most well suited for the job. Make a great first impression with this Sample Teacher Cover Letter With Experience, which can showcase all your skills and qualification in a very compact manner without sounding too overwhelming. 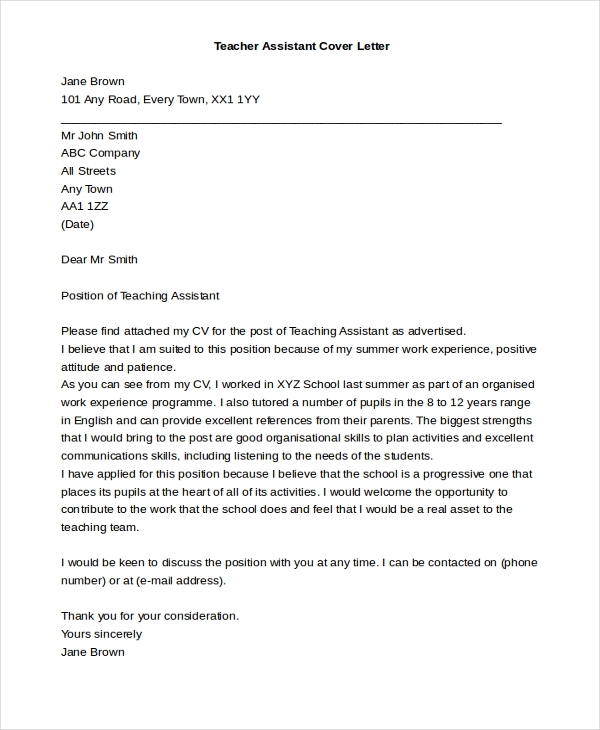 Here’s the best Teacher Assistant Cover Letter you can get your hands on. With this, you can cite your qualification from your CV and subtly mention why you fit the job description and make necessary changes to personalize it. 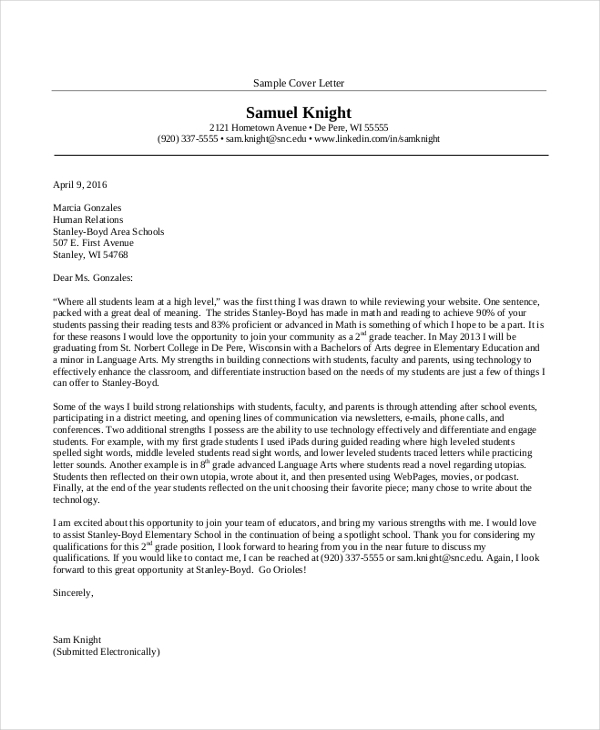 You may also see Sample Letters of Recommendations. 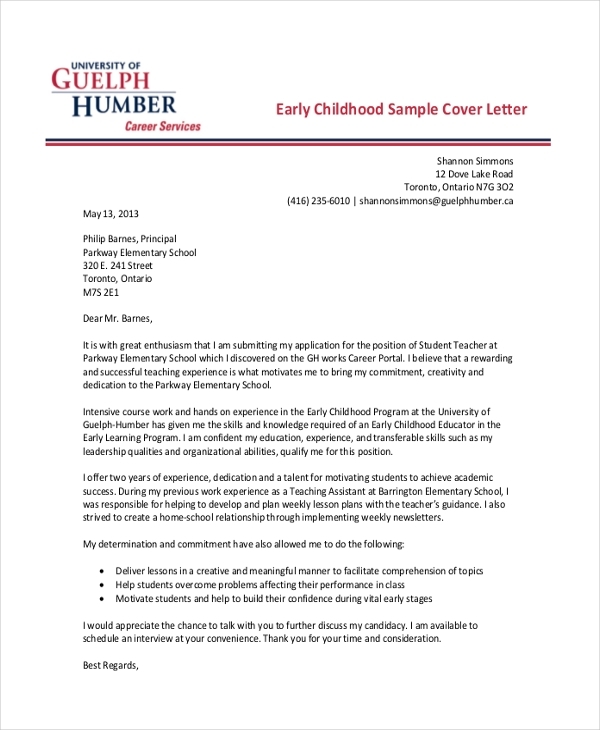 Try this Elementary Teacher Cover Letter for the job of your dreams. It offers three different samples which can be modified easily without any hassle and mentions all the general criteria which make you an eligible candidate. This Teacher Resume Cover Letter is everything you need to write up a great cover letter and woo the HR. It consists of brief guidelines to make your very own cover letter that speaks a ton about your expertise. 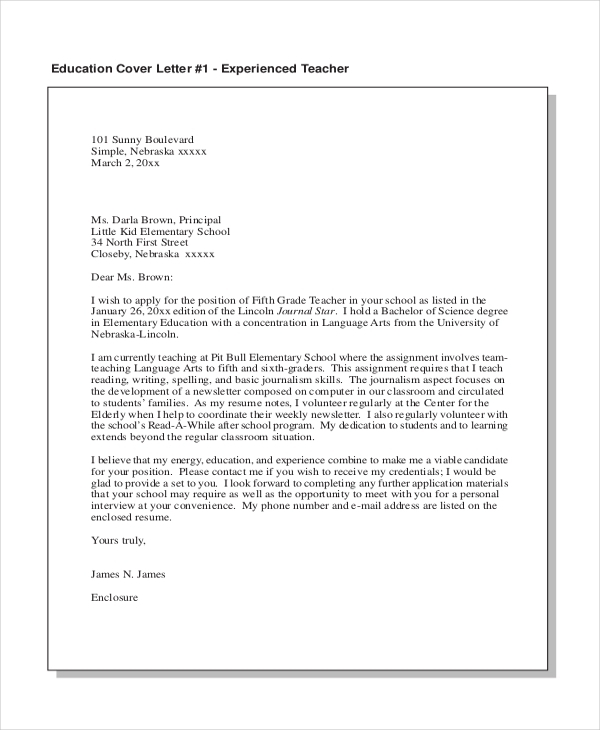 Get this New Teacher Cover Letter and create the best cover letter ever. It has several formatting tips, objectives with examples about what goes well as heading, degree, certification etc. 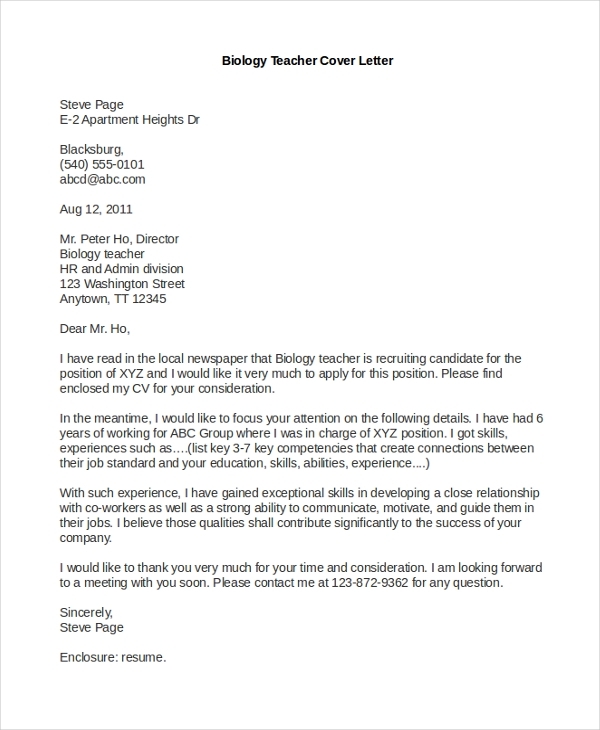 Try this Biology teacher cover letter and get your dream job. This is a clear example of what a cover letter must have and how briefly it can be written to point out the best in you. 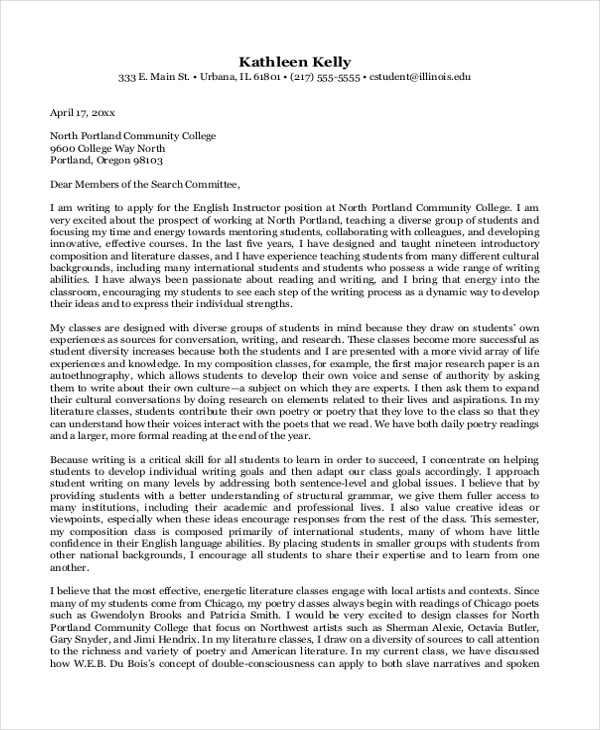 This College teacher cover letter goes to show what can be included and how one should format a cover letter. It has tips for formatting, writing style suggestion and a great sample as well. 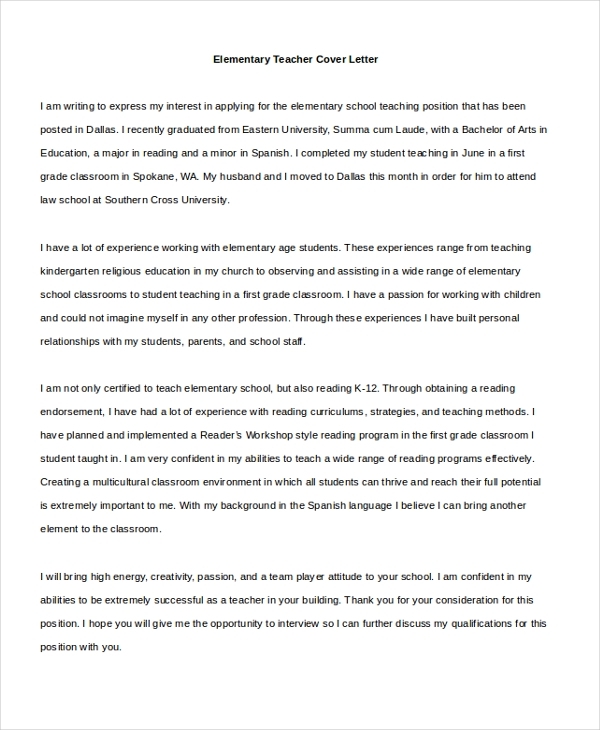 This Daycare teacher cover letter is a very simple example of what an ideal cover letter must look like and consist of. It has the right format and writing style which can be modified according to your preference. 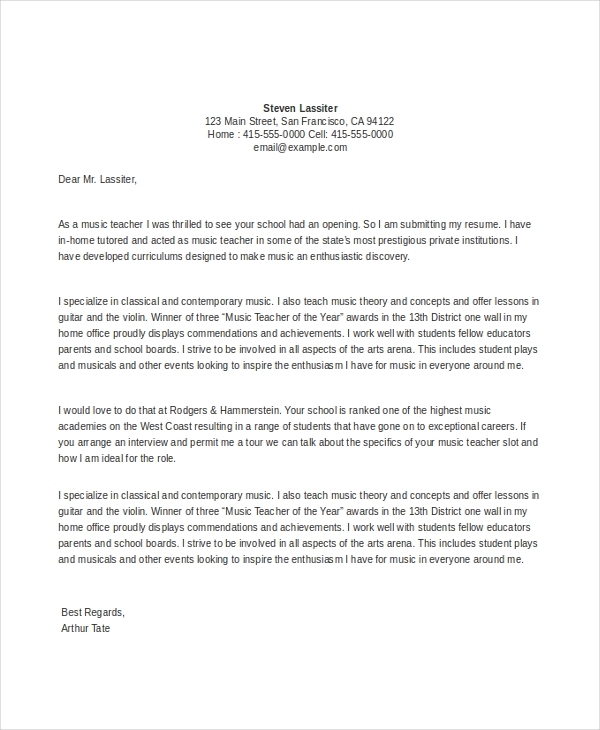 With this Music Teacher Cover Letter, you have to customize your personalized cover letter that speaks of your proficiency in the field. This is an ideal one for all music teachers and alike. How Can These Teacher Cover Letter be Used? There is only one usage for such cover letter samples and that is exactly what the name suggests. These set of cover letter enables you to chalk up a smooth cover letter which will be your very first intro when you apply for a job. These cover letter samples help you to personalize your very own cover letter without going off track, so it is definitely useful in putting your point across without having to give it much thought. Most of these samples have guidelines which will assist you in writing a cover letter very quickly. You may also see Administrative Assistant Cover Letters. 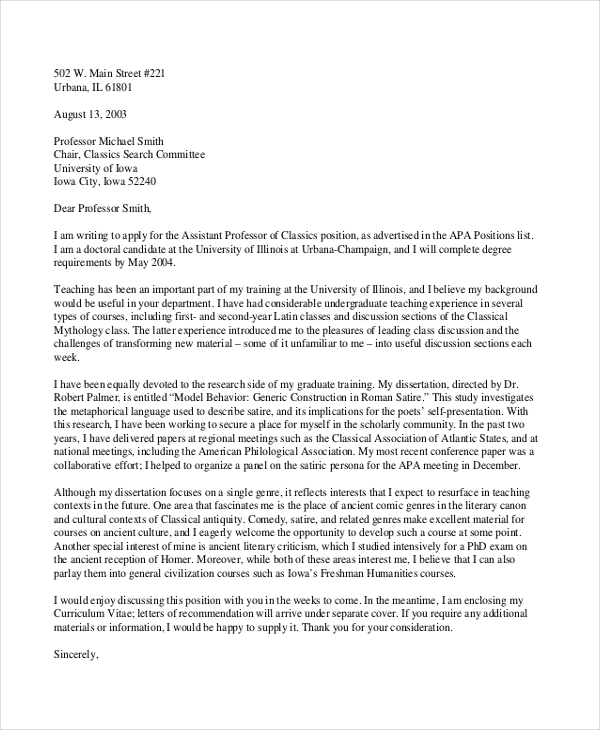 Who Can Use These Cover Letter Samples? These cover letter samples are meant to help you to find your inner writing skill and showcase all your abilities within a few words while mentioning why you are best suited for the job among all other candidates. These samples are meant for use as a set of guidelines following which you can have your personalized cover letter in not time. You may also see Character Reference Letters.